The history of art is a school subject taught in varying degrees in Education. Its aim is the teaching of artistic works that have been done in the past from a symbolic point of view. It is striving to highlight the artists, their lives, their views and how they stand out through their works. It also explains the impact of work on the public in a cultural context, demographic or religious. The Statue of Liberty, as gigantic qu'oeuvre, is generally on the agenda of most curricula. Following this page provided explanations of its construction, its origins and public vision about it. It therefore seems normal to find answers to her 3 elements in the duties of art history. Further works are analyzed from at least four criteria: forms, techniques, meanings, uses. It is through these four criteria that we will study the statue of liberty. This criterion is to examine the categories, types, genres, artistic styles, the structure or composition. This may be the least important criterion regarding the Statue of Liberty. This second criterion allows the study of materials, equipment, tools, materials, instruments, but also the methods and body techniques, gestural instrumental. This criterion takes its place as regards the Statue of Liberty. Third criterion in the description of a work, he approaches the messages (sent, received or interpreted), the senses (common, general, special, changes in direction in time and space), the code, the sign (signifier / signified), reception, interpretation, decoding and decryption. It is this test which will be very widely commented for the Statue of Liberty. This latter criterion results in studying the function, employment, recipients and categories of users, the destination, use, processing, discharges or diversions of the work. If this part is very important, it does not need a particularly long development regarding the Statue of Liberty. Finally, it is important to give her feelings about the work, what it evokes for himself. This part is purely subjective, it can not be developed here, yet he still has a short text giving my own feelings on the statue. But like any description of a work of art, it is mandatory to begin with a brief description of the context, the author and her work. Official name "Liberty Enlightening the World," the "Statue of Liberty" is a work of art by Auguste Bartholdi, French sculptor born in Colmar August 2, 1834 and died in Paris on October 4, 1904. Following the premature death of her father, her mother moved to Paris with her 4 children, a city where the young Auguste will follow the course of the famous Louis-le-Grand high school. He graduated in 1852 and then joined the National Superior School of Fine Arts where he studied architecture and painting. Passionate of Egypt, he will visit that country to propose the construction of a huge statue at the entrance of the new Suez Canal project refused because of lack of funding. Back in France, he began his career as a sculptor with "General Rapp," statue in Bordeaux, and then carry out various other works throughout her life, especially the Lion of Belfort and Vercingetorix of Clermont-Ferrand. Her masterpiece is undoubtedly the Statue of Liberty, which will occupy several years and require the collaboration of an engineer and a number corresponding to the United States. The Statue of Liberty began its history in 1865 when Republicans a meal during which the idea of ​​a gift to the United States was made. The young Bartholdi attended and immediately offered her Egyptian statue that was denied, statue redesign course. Her first trip to the United States dates from 1871, he allowed the choice of the site of implantation. He returned several times there, the last in 1886 for the inauguration of Miss Liberty. How does it fit in the works of her time? Because of its significant emotional charge, "older sister" of the Paris Eiffel Tower has never seriously been named one of "technology titans" that marked the end of the nineteenth century. This is unfortunate because, technically, the family of giants has another celebrity in the person of its big brother: The statue of Hermann (Arminius) the Cheruscan brandished sword, which was erected in 1876. The German sculptor Ernt him Bandel had spent thirty years of her life. It is up to him belongs the fatherhood of these copper giants. At that time, the United States not yet included among the great of this world power and considered such demonstrations with suspicion. Later, in 1941, in the momentum of development, America should take the lead in this gigantomanie with presidential sculptures of Rushmore Mountains in South Dakota. As the name indicates the Statue of Liberty is part of the area of ​​statuary. This is a statue in the round, term for a sculpture which is neither in relief or in high relief. We can go around a statue in the round, which is not the case of the other two types of statues. The chosen artistic style is neo-classicism. It is an artistic and literary current that is characterized by a willingness to return to the purity of the ancient classical art, considered in the nineteenth century as a reference. This trend began in the mid-eighteenth century and continued until around 1830. We will see later that the construction of the statue is after this period, indicating a desire to be connected with a given style not to follow the contemporary trend. From a general point of view, the Statue of Liberty is characterized by its large size, it is called "gigantic statue" or "titanic work". Made of copper on an iron frame (now Steel), it 46,05m meters high and about as much for the base, which rises to nearly all 100m high. It weighs the venerable weight of 225 tons. It represents a woman dressed in a toga dress according to criteria of antiquity. She is standing, static, holding in her left hand a shelf near the body and in her right hand a torch. The right arm is stretched to the sky. Her expressionless face shows some peace, insurance also. She wears a crown of rays and her feet are a broken chain. The base is the same neoclassical style, it consists of several stages, the first two being devoid of decoration, the third having an input of a refined style and the following levels of various sizes, is pure style neo classic. The penultimate level is a balcony allowing the visit. 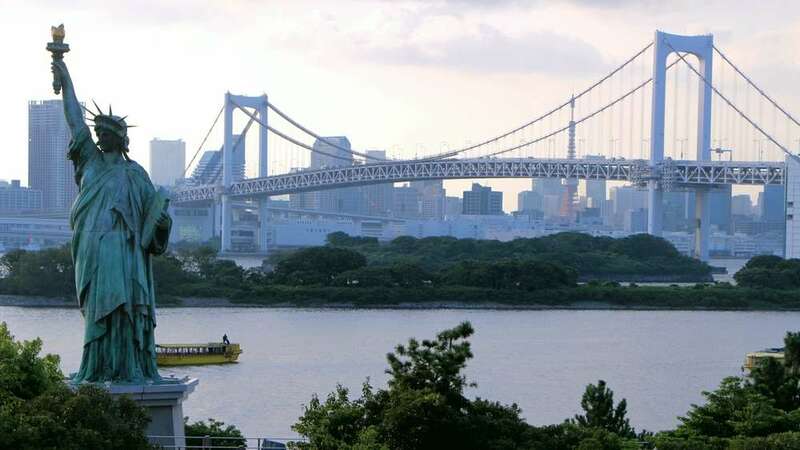 The location of the statue is also part of the work: Headquartered in New York Bay, on a small island, its height impresses visitors who pass nearby. Nothing in its immediate environment disturbs its magnificence, the skyscrapers of the city is 1km and a half too far to fill her horizon. The construction of the Statue of Liberty has required great skills in several areas. It is therefore normal that this part is one of the longest. The statue is formed of copper plates on an armature initially wrought iron but which has relatively recently been replaced by a steel structure. The plates measure 2.3 mm thick with a size of 3x2m or 6m2 each. The statue is made of 300 plates, so we 4.14m3 copper for a total area of ​​1800m2. The technique used to give forms to the plates is called "embossed" it is to work cold copper twisting in a predefined curvature. This curvature was given by the artist who used wooden battens to mount a wide architecture of the room to create, and that was the coat of plaster. The plaster model was then used as support to get the perfect curvature of each of the copper plates. The set was therefore made piece by piece, the foot, the hand, the handle of the torch or the folds of the robe were all made well. Once the part carried the plaster was broken, the cleats were recovered and the artist could build the next room. 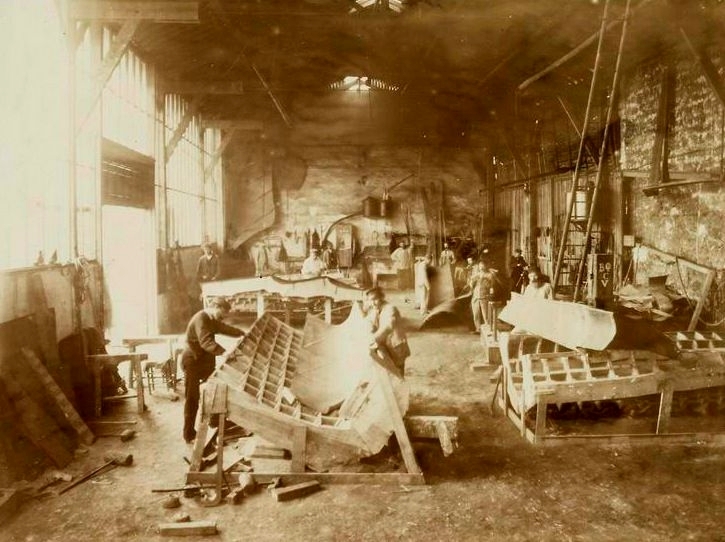 Throughout the progress of work pieces were stored in the shops waiting to be assembled together. The workers were working on special tables large sizes, usually curved (V-shaped, to manipulate the copper plate easily). They were not smooth, they were blister, each cell being approximately 30cm. These holes in the tables allowed to go hands to better handle the plate, rather large. The workshops were Chazelles street in Paris, were the workshops "Gaget and Gauthier" who had specialized in copper work. It was they who had done all the water supply lines in the city of Paris, for example. The workers at work form the copper plates of future Statue of Liberty. Once all the manufactured parts they were assembled in central Paris, always rue de Chazelles. Engineers built a 50m high scaffolds, which was raised over the advance of the statue. Everything started of course with the internal structure, wrought iron, which was used to support plates. These were riveted to the metal bars of iron. These bars are the result of the work of the engineer in charge of the framework. Indeed, if the author of the statue, Auguste Bartholdi, knows how to work the copper plates and mount them together, it needs an engineer to make the internal structure of her statue. He chose Violet-le-Duc, known for her work on the Notre-Dame de Paris. It chooses a masonry tower high stability, filled with sand and on which the cross beams would be fixed for holding the copper plates. Unfortunately for him he died, and her project was abandoned. The work was then entrusted to the engineer Gustave Eiffel, who had made a specialty of wrought iron. It is a wrought iron structure that served as a scaffold for the Statue of Liberty. This material had an advantage over the masonry tower, it is flexible. Located in New York Bay, strong winds are subject to the statue, wrought iron provides flexibility that would not have allowed a solid construction. Note that the internal structure wrought iron has been replaced in 1986 by another steel frame, more able to hold over time, oxidized iron, such as copper. The installation of the statue is twice: Assembly in Paris, a few months later disassembly, reassembly on Bedloe's island. This means that the installation could not be definitive. However, the technique used for the assembly of copper plates was riveting, of crushing a heated metal rod into the holes of two contiguous plates. The stem is deformed and bound the plates together ... forever. To dismantle the statue has asked an important work clean to avoid damaging the plates because the operation would have to be redone. View of Paris skyline and the Statue of Liberty's dominant. The base, however, was the responsibility of architect Morris Hunt. It was mainly constructed of concrete covered in granite, stone from a quarry in Connecticut. This choice was due to a finding on their low wear in a hostile marine environment. The base contained two anchors for the structure of Gustave Eiffel. For its construction Morris Hunt faced a practical problem: The base to be built on a small island, it was hard to bring all the staff in the morning for the day. So he built a small village on the other side of the work, the town in which the workers could live a few months time to finish the job. During the final assembly there was a technical problem: Auguste Bartholdi decided to 60cm away from the outstretched arm of the statue over her head, he considered them too close to one another. But he did not warn Gustave Eiffel. So when mounting arm is constrained by the frame, slightly buttressed, and this for 98 years. It was only rectified that when the restoration of the statue for the ceremony of its centennial in 1986. Charpentier: For the construction of scale models of workpieces, but also for the many scaffolds that were needed for the transport crates, etc. This without counting on the numerous derivatives or induced jobs: Minor to extract copper, marine for the transportation of the base stones, etc. The "Liberty Enlightening the World," as is the official name of this work is a universal symbol of freedom. She is known around the world but it is perceived differently depending on the time or the location where it is observed. But this is to ignore the primary intention of this statue, which began as a proof of friendship from France to the United States. This is initially a group of Republicans, lovers USA and wishing strengthen ties between the two countries is the origin of this project. On the French side, there was a clear desire to showcase American democracy facing the inclinations of the Second Empire. In the US it was mend the country split in two by civil war 5 years is called nowadays "Civil War." But as the French side the enthusiasm is at the rendezvous, as the American side this gift was not perceived as a good. The reason was to find funding for the work of the base, which was the responsibility of the United States, while France was responsible for the statue itself. The symbol of the friendship between the French and American peoples, expanded over time to friendship between peoples, has not been seen for a long time as well. The statue was intended as a symbol of Liberty is the symbol that has taken the upper hand. Yet there is hardly a single element in its composition representing this symbol: The chains of slavery, her feet are broken. We see them just as they are flush with the base and are rarely reflected in the reproductions that are made all over the world. The other symbols are obvious. 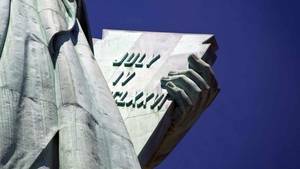 On the tablet she holds in her left hand he wrote a date in Roman numerals: July 4, 1789, date of American independence. The reason for the presence of this date is simple: the gift of the statue was made for the centennial of American independence, it was supposed to be inaugurated stack that day. In practice, it turns out that she was 10 years later, but the intention was there. The crown is made up of 7 rays represent the 7 seas of the world (North Pacific, South Pacific, North Atlantic, South Atlantic, Indian Ocean, Arctic Ocean, Antarctica) or 7 continents (North America, South America, Africa , Asia, Europe, Oceania, Antarctica). It is also a symbol that is found in several previous works, such as the Great Seal of France (Official symbol of the French Republic since the Second Republic). The stature of the work is also a symbol insofar as it illuminates the World (in practice, she holds a torch up in Heaven). This is an allegory of the power of Liberty that spans the world. For many years this symbol has instead become a symbol of American supremacy in the world. This can be seen positively or not, depending on the culture in which we place ourselves. The location of the statue is important. Placed at the entrance to the port of New York she was the first building of importance that saw immigrants landed on Ellis Island, 700m away. For them the Statue of Liberty was the symbol of a better life, a hope for improvement of their living conditions. The statue is mainly used in graphic art to highlight a disaster, whether natural or not. Universally recognized symbol of the city of New York she appeared in many movies partially destroyed, as is the case in "Planet of the Apes." It is also used in literature or video games. If one moves geographically and we went to the Middle East, some people believe that the US is their enemy. As such interpretation of the statue is of course quite different. This is a symbol of imperialism, of will to dominate, and by extension for the submission of peoples. What is abberration in view of the fact that it was built for the opposite reason. If one travels in time and we go back in time to the late nineteenth century the statue was perceived differently between the French and American peoples. The French have a passion for the project and its financing is is felt. Many municipalities have made donations, families little reluctant to put their hands in their pockets to the "size of France." All saw here a way to show the young nation of the New World the technical power of their country. The Americans, themselves, did not ask the French. Unable to refuse the gift, they had to assume the construction of the base. If engineering posed no problem in funding posed, which offset the end of construction and therefore partially justifies its delay in delivery. Always back in time, but a little less, it is essential to mention the role of the statue in American immigration. Indeed, from the late nineteenth century to the mid twentieth century, it is 40% of the new population of the United States that went through the port of New York. Newcomers knew he would be greeted first by the Statue of Liberty, physically installed at the end of their long transatlantic route. The vision of the statue was a symbol of their arrival in the new world. The boats skirted immigrants Liberty Island (originally named Bedloe's Island), then they docked at Ellis Island, 700m away. The passengers were disembarked and had to pass a strict sanitary control which broke some installation dreams, with a return to the old continent in the key. This means the importance entry to the United States for newcomers, and the Statue of Liberty as their symbol. The Statue of Liberty has two uses. The main consists of its symbol, the statue is used to convey a message, to express her feelings. Thus she was used in 2014 to celebrate the 70th anniversary of the Allied landings in Normandy during the Second World War: the French Sandrine Kukurudz brought down a rain of rose petals from a helicopter, by flying around these flowers to the statue symbols of peace. Another place, another time: China in 1989. On 27 April this year the Chinese students settle Tiananmen Square to protest against the authoritarianism of the central government. 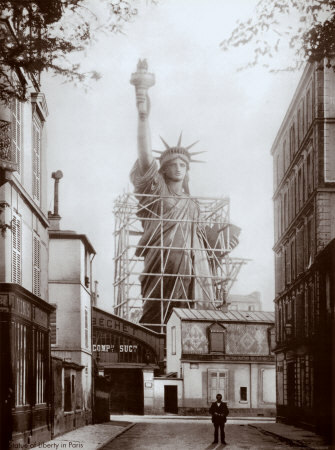 One of the first events was the installation of a copy of the Statue of Liberty, plaster, on the square. These two examples show that the statue can be used for several purposes: To highlight peace in the world or demand more freedom. In one case as in the other function of the statue was to convey a message. That's probably what it does best. 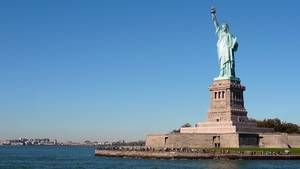 Other use, more convenient one: The statue is an important step in the visit of New York or the United States. It has a tourist office here. The museum contains the base, upper viewpoint of the base and the statue itself up her crown, can be visited. It fuels the tourist flow to New York and increases the service offer for visitors. Moreover, by its aquatic position, it involves many jobs and so has the economy of the city up. It is certainly not the biggest employer in the city but it is an iconic employer. If one asks the recipients and users of the statue we fall back into the same cases as those seen previously: From a symbolic point of view, the statue is used by the oppressed or those who feel that way. There is a predilection for Western peoples or South Americans, the importance of the statue in their eyes is more important than for Russian or Asian, who have their own symbols of freedom in their own cultures. From a practical standpoint, the statue essentially benefits the tourists from around the world are giving appointment in New York to see the statue. 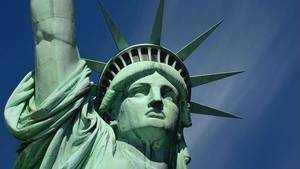 As a universally recognized symbol of the Statue of Liberty has been repeatedly copied. Around the world there are reproductions. In France 31 copies have been identified, some have an undeniable historical interest, such as Auguste Bartholdi used as a model or replica placement on the island of swans in Paris. Others have a decorative purpose, such as Bordeaux, St Affrique (this is a stylized copy), or St Cyr on sea, golden. Finally others are mere copies commercially oriented, usually made of ordinary matter (plastic, resin, polystyrene). 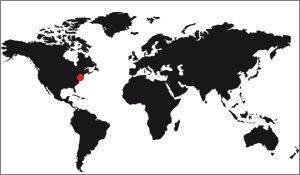 Most countries of the world have a few copies on their territories, with a greater amount for the Europeans and Americans countries. Africa is relatively neglected in this regard, there is little replicas of the Statue of Liberty on the continent. Asia has some of them (Japan / China / Thailand) must be mentioned the particular case of the US, who have by far the replicas. There are several kinds. On one hand, the so-called "historical" replicas, which were put in place during the twentieth century for various reasons. We find both, for example, back to back on the roof of a building in New York. Furthermore commercial copies, recent, are often in place shortly and serve as advertising signs. Finally, and this is a very important point about it, you should know that in 1950 an American patron, some Whitaker, from Kansas, launched a campaign called "Strengthening Freedom arm." She was melting and install copies of the Statue of Liberty everywhere in the US. This campaign lasted until 1952 and it is 200 statues were made of iron covered with copper plates. They had little in common with the original, with the main feature a youthful face that differentiate much from the New Yorker statue. There are still today a hundred, most mounted on pedestals of varying size and exposed in parks or at the entrance to government buildings. Obviously it was expected that the Statue of Liberty being diverted. If the rise of the Internet allowed the emergence of many pastiches, cartoonists are always served to her to describe a situation, usually in connection with Liberty. It should be noted that the statue itself is seen as a character who happens that an event as being an actual hijacking. Already journals of the 30 present the statue in their columns. Difficult to give guidelines for the study of the statue when it comes to give her personal feelings face to this monument, simply because if it is personal, the feeling can not be reproduced as such for other . But it allowed me to write here the opposite impressions that emerge from the study of the statue. The posture, calm, determination of the statue rather perplexing. This is a work that seems frozen in time and space, in which absolutely no apparent movement. This is exactly the opposite of the monument of the African renaissance, Senegal, another monumental statue (52m high) metal, but that shows an interesting dynamic. Her New York colleague made anemic side. Symbols are interesting, but they would have been more interesting if they were focused on the same concept. Mix Liberty, Independence of the United States, the clarification of a necessarily obscure world while highlighting the seven seas and seven continents of the world, that's a lot for a single statue, as great as it is. Another strange element to a statue of Liberty, it has only one symbol of Liberty, at her feet, so inconspicuous: the broken chains of slavery. The statue of Niccolini memorial in the church Holy Cross in Florence, conducted by Pio Fedi between 1871 and 1877 is much more expressive about it: She holds the chains of slavery in hand, instead of the torch . All these negative elements, however, unable to rule out the Statue of Liberty of the great works of the nineteenth century, it remains for me an exceptional work of art of great quality with a strong emotional impact. But her vision is perhaps too banal for it provokes in me a deep sincere emotion.